One tin of black eyed beans, fresh bird’s eye chilli finely chopped, one whit onion, red pepper, peanuts, salt and pepper and peanuts and cooked quinoa. Whizz in a food processor, then add a tin of sweetcorn. Taste and adjust to your liking. Then ad some olive oil, make into patties and coat in cornmeal (uncooked) and brown in a frying pan with olive oil. Job done. Delicious! 1. 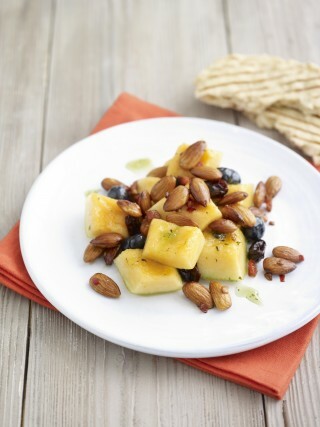 Toss the almonds in oil and cook over gentle heat for 4 mins, tossing them around regularly. Add the chilli, salt and garlic and cook for a further 2- 4 minutes or until the garlic turns into a golden colour. 3. Toss the melon, fruit and fresh mint together and serve with salad leaves. Delicious with a spoonful of natural yoghurt. Put almonds into a food processor and pulse until it forms a flour (or you can use packet almond flour). Now add the remaining mixture and pulse until combined. If it seems dry, add a bit more coconut. Then spoon out the mixture and roll into balls. Coat each ball by rolling in coconut. These are great for afternoon snacks, pre and post run and every time in between. You can also play around with the ingredients, changing the nut (pecan and walnut?) and add cinnamon, ginger, even a bit of cracked black pepper. If you’re lucky enough to run with us in Brighton, some of our runners even get these at the end of a run. *for an added protein kick, replace the flour with almond flour although it will make for a denser, less fluffy pancake. Combine, flour, baking powder, sugar and cinnamon. In a separate bowl, whisk ricotta, milk and the yolks of the eggs. Combine with the dry ingredients and add the egg until it forms a smooth mixture. It should be a thick batter so if need be, add more milk. Meanwhile, beat the egg whites until they form soft peaks. Gently fold into the mixture. In a hot buttered grill pan, drop two ladles of the mixture into a hot pan. Turn the heat down and wait until you begin to see the edges brown and little bubbles appear on the surface. Now flip over. Cook until golden both sides, put to one side in a heated oven until all the mixture is done. Serve with fruit salad, Greek yoghurt and a drizzle of maple syrup. Sit down, devour! The best thing about these pancakes is, if you make too many, you can keep them and eat them the next day as snacks. Dice the cucumber, tomato, onion, radish and pepper and mix with the coriander and parsley. In a jar or sealable container, put 75ml of olive oil with the lemon juice and zest, vinegar, garlic and sugar, shake and season to taste. Pour the dressing over the salad and toss lightly. Mix together the cardamom, allspice, chilli, cumin and a quarter-teaspoon of salt, and spread on a plate. Toss the chickpeas in the spice mixture to coat. Heat the remaining oil in a frying pan and over medium heat lightly fry the chickpeas for two to three minutes, gently shaking the pan so they cook evenly and don’t stick. Keep warm. Divide the salad between four plates, arranging it in a large circle with a slight indent in the middle, and spoon the warm chickpeas in the centre. Drizzle some Greek yoghurt on top and some seeds of pomegranate. Serve either with Lebanese flatbread of with sliced chicken or salmon for extra protein. This is a recipe adapted from Ottolenghi. Line the loaf tin with greaseproof paper or baking parchment. Then cream together the butter and sugar until pale and fluffy. Then gently beat in the eggs one at a time, adding flour as you go to prevent curdling. Now, on a slow speed if using a food processor, fold in the ground almonds and zest. Spoon into the lined cake tin, smooth the top and bake for 45-50 minutes at 180 C/gas mark 4. Test it with a skewer – the point should leave the cake without any mixture stuck to it. Don’t overcook though! Finally pierce with a skewer and squeeze over the juice from half the lemon. Leave the cake to cool in its tin before removing and serving with fresh raspberries. Add a teaspoon of honey to a saucepan with a tablespoon of water. Warm through to help dilute the honey (some of the water should burn off) then add the orange juice and lime. Taste and adjust if it’s not sweet enough. Reserve the liquid. Put the nuts on a roasting tray or a clean pan and toast for a few minutes until nice browned. Keep to one side. Brush the peach halves with the honey liquor and then place flat side down on a hot clean griddle pan. It should only take a few minutes to chargrill. Serve immediately with the rest of the honey juice, hazelnuts and some chopped mint. Goes really well with Greek Yoghurt. This recipe is inspired by the food that I ate while in Cambodia where I was writing about taking part in the Angkor Wat Half Marathon (watch out for our upcoming December 2019 trip) for Run ABC magazine. It’s packed with mint, chilli and all important fresh turmeric which is used in so much of Cambodian food and is particularly renowned for it’s anti-inflammatory properties helping you to recovery quickly – while enjoying LUSH food. In a pestle and mortar, grind together the chopped up chillies (you may not need two, that’s just me!) with grated turmeric root (1 inch piece is great) and then add fish sauce and rice wine vinegar. Now add palm sugar to taste, along with lime juice. (You’ll have to adjust the seasoning to how you like it but it’s meant to be spicy, sweet and sour – rice wine vinegar will sweeten and the palm sugar helps to take out the fire!). Now add the peppers, carrot, and chopped tomatoes, and lightly pound with kaffir lime leaves with the dressing. Finally add it to the lettuce and combine well, with plenty of fresh herbs and sprinkle with dry roasted peanuts. You can serve this with pan roasted salmon, a sliced beer, chicken or tofu, whatever takes your fancy. So, this is not quite as good as Cambodian food eaten on the side of the road at a street food stall (I’ll never forget fish baked in salt crust with a banana leaf salad at a street stall!) but it’s pretty good!